With great fall weather coming to Mesa, it’s time to get outside and what better way than with music. If you didn’t know, City Limitless has a great local music scene so you’re in for some awesome music experiences. From a leisurely afternoon with some good tunes to a soundtrack for your Friday night on the town, here are few free concert series to check out in and around Mesa! 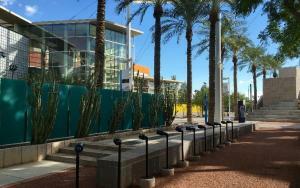 Mesa’s mecca for the arts offers visitors and residents a free lunch time concert series in the heart of our downtown. Every Thursday afternoon starting November 5, the Mesa Arts Center (MAC) hosts local artists playing a wide variety of musical styles from a string quartet to classic blues. Shows are in the Wells Fargo Garden performance area of the MAC campus. Brown bags or picnics are welcome, or you may purchase a meal or snack on-site. For a full list of performances click here. Spend an evening with your family and friends under the stars at the Downtown Concert Series. 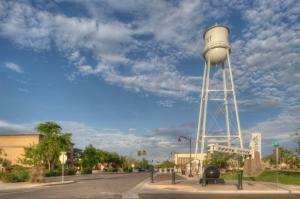 The concerts are held at the Water Tower Plaza in the heart of Gilbert’s Heritage District, one of the hottest new entertainment scenes in the Valley. While picnics are welcome, this might be a good time to check out one of the many amazing restaurants that are located in the Heritage District. Try the wide variety of street tacos at Barrio Queen or take a bite of authentic Neapolitan pizza at Pomo Pizzeria Napoletana. Be sure to stop by Petersen’s Ice Cream for a sweet treat to finish off the night after the standing ovation is over. Enjoy a family friendly environment for kids of all ages at the Eastmark First Friday Concert series. Hosted in Eastmark Great Mark in Mesa, the series is a great place to bring a picnic dinner and enjoy the night with your family. Concerts are on the first Friday of the month and feature a wide variety of local bands. Share your favorite band or artist you hear with us using #CityLimitless because we’re looking for new music to listen to around the Visit Mesa office!